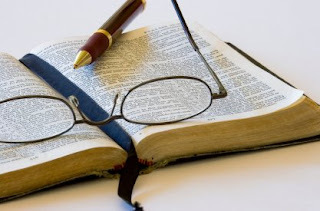 I know it has only been just 2 days of reading the Bible as part of my commitment to reading the whole Bible this year, but just like yesterday, I found a few verses of Scripture to be very interesting to read. First, let me just share real quick something from yesterday's reading. While reading the first 10 chapters of Professor Grant Horner's Bible Reading System, I found Isaiah 1:4 to resemble the state of society today - morally and spiritually. Isaiah 1:4 (ESV) - Ah, sinful nation, a people laden with iniquity, offspring of evildoers, children who deal corruptly! They have forsaken the Lord, they have despised the Holy One of Israel, they are utterly estranged. When you stop to look at our society today and I think the same observation could be made anywhere in the world and not just in the United States, but this is what is visibly apparent right before our eyes. The moral and spiritual corruption that exists is observed as a whole nation and it has been passed on to succeeding generations. If anyone should wonder how such a transference of sin, from one generation to another began all we have to do is look back to the Adam and Eve in the Garden of Eden (Genesis 3) and then to see Can kill his brother Abel (Genesis 4). There is a terrible moral and spiritual corruption that exists and we need a great awakening, but it is not going to happen just because we ask God for it to happen. No, we must want a great awakening to take place in our own lives first and then to plead in prayer that it takes place in the lives of every brother and sister in Christ, creating an awakening of God that is so powerful and visible that the most busiest place on Sundays is the church and not Costco or the malls. I pray that this would happen soon too. Matthew 2:1-2 (ESV) - "Now after Jesus was born in Bethlehem of Judea in the days of Herod the king, behold, wise ment from the east came to Jerusalem, saying, "Where is he who has been born king of the Jews? For we saw his star when it roset and have come to worship him." Herod the Great, who was king at the time had inherited his throne from his father and this type of inheritance to the throne can be seen from the most recent Royal Wedding of Prince William and Kate Middleton. Prince William will inherit the throne of the kingdom one day, from his father Prince Charles, but neither will lose it to someone that feels they can rule as a better king through an electoral process. Herod was already king, but these wise men came asking, "Where is he who has been born king of the Jews? This should make Herod's reaction to hearing that someone else was born king of the Jews, essentially competing with his rule king could not be tolerated. This is what I think many people miss when reading this portion of Scripture because I know I have in the past until now. Jesus did not have to wait for His Father to die before He could inherit the throne. His rule and reign as king began from the moment of His birth, but it had already existed in eternity past as well. Jesus was born as a king and king of the Jews. Romans 2:4-8 (ESV) - 4 Or do you presume on the riches of his kindness and forbearance and patience, not knowing that God's kindness is meant to lead you to repentance? 5 But because of your hard and impenitent heart you are storing up wrath for yourself on the day of wrath when God's righteous judgment will be revealed. 6 He will render to each one according to his works: 7 to those who by patience in well-doing seek for glory and honor and immortality, he will give eternal life; 8 but for those who are self-seeking and do not obey the truth, but obey unrighteousness, there will be wrath and fury. Many people only want to believe that God is more merciful, forgiving and kind than He is to be judgmental, filled with wrath and fury. They want to ignore these aspects of God's character that pertains to His disdain for sin that has cause such a separation from Himself. But verse 4 reveals to us something that exemplifies the character and attitude of people today when it comes to God's rich kindness, forbearance and patience toward those who have yet to repent of their sins before He executes his just judgment upon them. They have forgotten that God acts this way, not because he hasn't seen those sins, but because His kindness, forbearance and patience toward them is a sign of His mercy that should lead people to repent and seek His forgiveness. And God will render to each as Paul writes in verses 7 & 8, those who have recognized God's kindness toward them that has led them to repent, they shall be given eternal life and to those that have not because they are selfish, ignoring the truth of Scripture and are more obedient to living unrighteously than in the righteousness of Christ, I shudder to imagine the wrath and fury that awaits them. I pray that many people who are like this would repent and put their faith in Christ soon, before it is too late because we are all one heartbeat away from eternity. Romans 2:14-15 (ESV) - 14 For when Gentiles, who do not have the law, by nature do what the law requires, they are a law to themselves, even though they do not have the law.15 They show that the work of the law is written on their hearts, while their conscience also bears witness, and their conflicting thoughts accuse or even excuse them. My answer to this is that every society knows that it is wrong to take the life of another. Murder is never right and I also cannot think of a society of people that would actually condone murder as something good too. There are people that believe that it is right to murder, but it is not. It never has been and never will be. Without even knowing that this is a commandment from God, every person is born with an innate knowledge that it is wrong to kill another person. Their heart tells them that it is wrong and their conscience speaks as well, if such a horrible act has been committed. Many have been executed by captial punishment and have died with the guilt of their sin upon them and will have to face God for that and He will neither be merciful, nor forgiving. Hell will be their reward. Proverbs 2:1-5 (ESV) - 1 My son, if you receive my words and treasure up my commandments with you, 2 making your ear attentive to wisdom and inclining your heart to understanding; 3 yes, if you call out for insight and raise your voice for understanding, 4 if you seek it like silver and search for it as for hidden treasures, 5 then you will understand the fear of the Lord and find the knowledge of God. These five verses describe the attitude of our own heart that is in active pursuit pertaining to understanding the fear of the Lord and finding the knowledge of God. Notice the words that are used by Solomon: receive my words, treasure up my commandments, making your ear attentive to wisdom, inclining your heart, call out for insight, raise your voice for understanding, seek it like silver, search as for hidden treasures. These words describe a humble and submissive attitude of one that seeks after God too. When our heart has an attitude like this, in a genuine search of knowing God, the key word follows in verse 5, then. Then we will begin to gain a better and an increasingly deeper understanding of the awe and majesty of God, knowing who He is more and more on a daily basis. Without having an attitude of the heart that is described in verses 1-4, one will never come to truly understand and know God, which is a big obstacle for many to overcome because pride gets in the way thinking that a person knows all there is to know about God. I don't know how often I may write an observation summary of my reading for the day, but I may do so every other day. And if you haven't chosen a Bible reading plan for the New Year, there are many to choose from at YouVersion. So stop by and browse the list of plans and pick one. It doesn't have to be one that takes you through the entire bible in a year. It could be one that reads through the Gospels, or the New Testament. Find one that you want to accomplish and get started. You'll be blessed that you did. Great idea to blog about your readings! I, too, am doing this system, and am VERY excited. I have subscribed to your blog so I can follow along with you even though I am a couple of days ahead. Hi, Bro. Kurt. I started this system on 8/22/11. I have 105 days to go to have went through the whole Bible. I have seen things that I have never seen before ! I plan on making this a life-long following. I have read Acts and Proverbs four times. There are about ten others at my church ( including my wife ) who started this, also. Thanks !